Indigenous organisations, especially Native Title Prescribed Body Corporates and claim groups need a vision statement. This statement should serve as the sign-post to point all activity towards the greater outcome of the group, whatever that may be. It should provide a clear and succinct direction about the purpose for which the group came together and the aspirations they are working to achieve. This statement should also point to the way benefits are prioritised to avoid day to day arguments about who receives benefits or why some activities are funded and others are not. A clear vision statement becomes the guide for Boards and funds trustees about the allocation of priorities. Yet, many PBC’s and other organisations have vision statements – why isn’t this helping clarify priorities like it should? cannot bring the theory into the world of Aboriginal dynamics, and they often leave behind the communities that these statements are meant to represent. What you end up with is something so generic that it is meaningless, or even if the expression is good, is not clearly explained or understood by concurrent Mission and Values statements. In summary, it is the process that creates a clear and properly understood vision statement, not the word-smithing. In my work I help Australian Indigenous groups develop and execute strategies and I believe that in order for them to do so successfully, they must use vision statements that describe their aspirations, outline how they will get there, and incorporate their “die in the ditch” values that they will uphold. To this end I help PBC’s and other Aboriginal organisations stand in both worlds by developing a vision statement that encompasses Aspirations, Purpose, and Values. The Purpose of the group on the other hand describes what the body corporate is here to do, who it benefits and what it does. The Purpose stays in the present and should serve as a guide to what this corporation will not do as much as what it does. Finally the list of Values further helps guide the organisation about what it is there for, how it will do its work and how it will behave, and also, what it will not do. These should be “die in the ditch” values. By that I mean values that it will never betray, that it would be better to fold up and go away rather than betray. These are not values like “honesty” (why would you behave dishonestly at all as a PBC?) but values you will not betray such as “Preserving Country”. As I said earlier, it is not the word-smithing but the process that brings out what is important so that it can be encapsulated. The process starts with the Values and asks people to think about how they want to live their lives in this community, and therefore how they want their representative corporation to behave. As the responses are drawn out, further questions are asked to see what some words really mean, examples of those values in action are discussed so that everyone knows what is meant by single words or phrases. Once people are in “the mood”, because in talking about high values they will put themselves in a state of looking beyond their current (often selfish) desires and towards the greater good of the group, the process then explores their Aspirations. It needs to be made clear that these are the big strategic aspirations of the community as a whole, not of individual families or groups in the community. Neither are they goals that are reachable in a short time but rather a description of “the end game”. I usually ask them to look 10 to 20 years ahead and “see” a time when they have achieved what they are working for and what that looks like. Finally, we work on the Purpose of the corporation as it represents the group. This is made easier because people now have a clear sense of how they want their corporation to behave and what it is ultimately there to achieve. 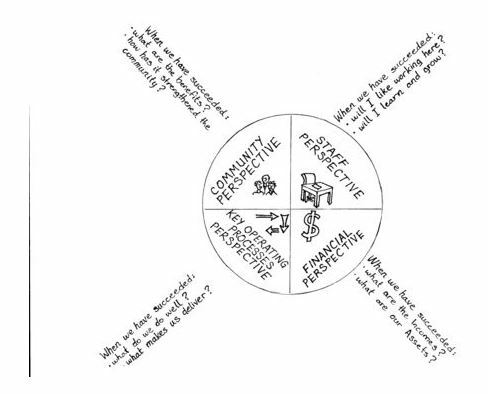 In this context, discussion about “purpose” moves beyond “looking after money” to examining who it is there to benefit, what it will do for those people or groups, and what kind of activities it will pursue. I said earlier that the Aspirations should be quantifiable. 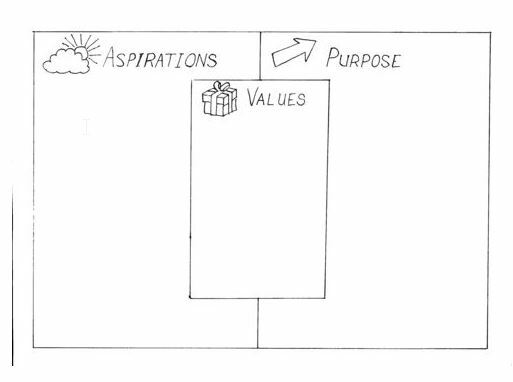 Working in the order I lay out, the Aspirations should fit into context with both the Purpose and the Values, and together they should provide a very clear direction of where this corporation is going. However, if the Aspiration can be measureable it will bring those aspirations to life to create motivation as well as direction. describe the tangible goals of the Aspirations is that these quantifiers can later be used as performance measures by applying the Balanced Scorecard methodology, including the cascading of these “head” measures into activity and even individual staff performance measures. The facilitation is based around the questions shown on the pictorial, and these are further teased out in the discussion to define the key features of successfully achieving the aspirations of the group. At the end of the process the three elements of Aspirations, Purpose and values are summarised – no great word-smithing required as long as everyone is clear about the meaning of individual words and phrases. All this can be done in a day’s community consultation, certainly made interesting and amusing, and banish all those boring workshops on vision statements. The next stage is the application of the Aspirations, Purpose, Values, Statement – the subject of another article! Ultimately the statement can brief new members and leaders about what everyone is working together to achieve.